Then she made...: Happy Mail! This year though, I was especially interested in seeing it and guess what? It arrived today. In-my-mail-box! I didn't even have to go buy it. So, why did it come to me? Well, remember these guys from last year? They changed their clothes a bit, packaged themselves up in a box with a bunch of shipping popcorn and went on a trip visit BH&G. Their trip was a success and they ended up in print! How's that for a post card home? In all seriousness, BH & G contacted me at the beginning of the year and wanted to publish my idea. I was thrilled. THRILLED. (It's always fun when someone, or a magazine, expresses interest. It kind of makes you feel like you're doing something right, ya know?!) You can find them on page 65 and then the instructions are on page 69. 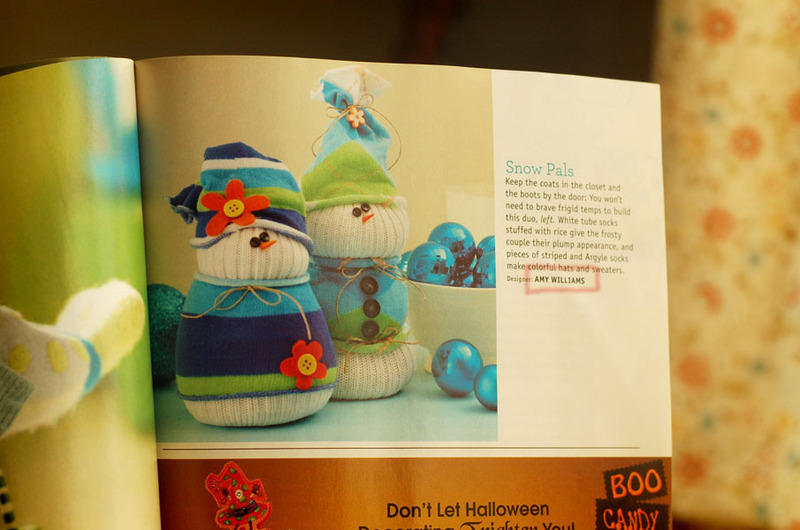 There's tons of other fun ideas in the magazine too, totally worth checking out while you wait in line at the super market. Hmmm, getting happy mail kind of makes me want to send happy mail ..... perhaps I should do a giveaway of sorts. What do you think, you in to win? Not sure what. It has been awhile since I gave away some jewelry, perhaps it's time again.... I'll ponder. If you have any ideas, let me know. That is so fantastic! I loved these cute little guys. Congratulations!! I'm a crafter myself. my favorite things to win are materials. Fabric (scraps, yardage, fqs) is my favorite, but I've been wanting to make my own jewelry but I can't afford to put money into starting it right now. So the materials for that would be an awesome giveaway. Congratulations!!! So exciting :>) I think you did the post before I started following you so I need to give this one a go - too cute to pass up!!! Congratulations! I love your snowmen! 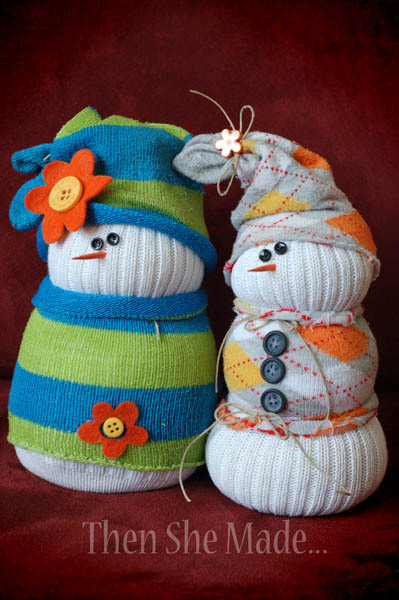 In honor of your snowmen being published, how about giving away some snowmen? That would be awesome! I, too, think a pair of snowmen would be great. The necklace also sounds fun. The trifecta would be to add an autographed copy of the magazine. What fun for you! Congrats! Congratulations! That's way better than the bills that make their way into my mailbox. I agree with Susan's suggestion of a snowman necklace - maybe in a set with other jewellery like earrings. I know, I know - that's pushing it! It must be a wonderful feeling to see your work in print. This is much deserved. Congratualtions!! Thats so awesome! I made these little guys last year for a gift for a friend and she loves them!! 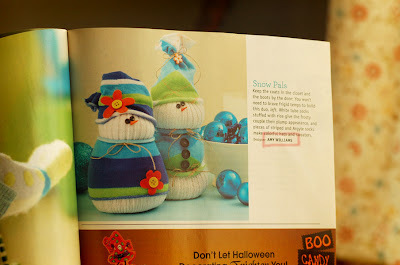 They are adorable and I am going to make some more this year! I can't wait! You're blog is truely inspiring! WOO HOO!!!! This is fantastic. Congratulations! Congrats!!! I loved your snowmen! 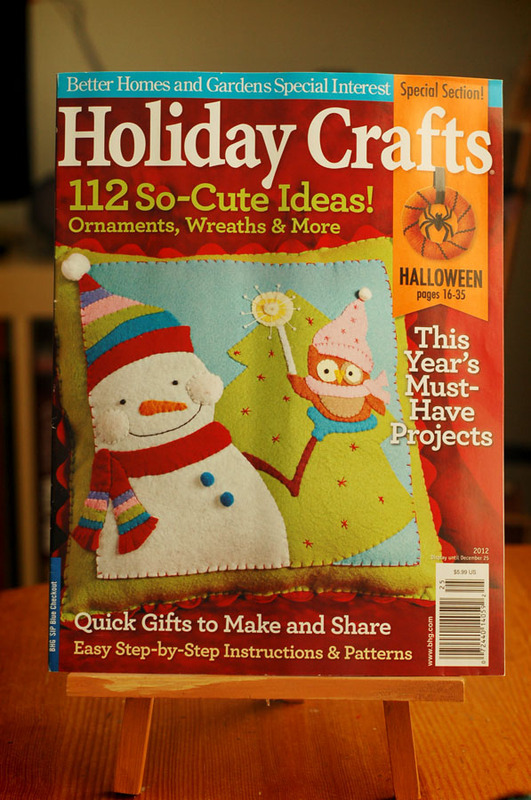 this has to be very exciting to see your craft in a magazine!